We all know that diet and lifestyle can influence our risk of heart disease, but how does that explain the “healthy” marathon runner dropping dead at 50, or the lifelong smoker living to 100!! Cardiovascular disease can be influenced by genetics, but there is a lot you can be in control of. Diet, lifestyle choices like smoking or some we don’t choose like stress, and supplements like B vitamins and fish oils can reduce the risk of cardiovascular disease but your genetics have a big influence as well. While taking fish oils daily may be essential for one person, somebody else may only need to eat fish 2-3 times a week to get enough omega 3’s. This is determined by our genes. For someone with the MTHFR gene polymorphism, it may be essential that they regularly take an activated form of folate, this will prevent high levels of the homocysteine (an inflammatory marker) and reduce the risk of blood clots. Cholesterol has been blamed for heart disease for a long time now, and Statin medications are one of the most prescribed drugs available, yet just as many people have heart disease with normal cholesterol levels as people with high cholesterol. In fact, good levels of cholesterol have been associated with a reduced risk of dementia and mental health problems as people age, what we need is the right type of cholesterol. The APOE, LPL, APOA and LPR genes can determine whether we have high levels of the good healthy type of HDL and LDL (yes not all LDL is bad), or have high levels of small dense LDL particles which can cause cardiovascular disease, especially when combined with inflammation. If you have the genes for cardiovascular disease it would be a good idea to get a test like the comprehensive cardiovascular test to see if you are currently at risk, this test measures all of the different types of cholesterol, LDL particle number and inflammatory markers. Some people say that they would rather not know if they have picked up their mum or dad’s genes for a particular condition, but knowing what genes you have helps you make smarter diet and lifestyle choices to influence your genes. Genetics may increase your risk of a condition, but making the diet, lifestyle and nutrition changes can help you to influence your genes in a positive way and reduce your risk of chronic health conditions. How to get your Genes Tested! A few years ago it used to cost thousands of dollars to get a genetic test, now thanks to companies like 23andme and SmartDNA it is a lot cheaper. 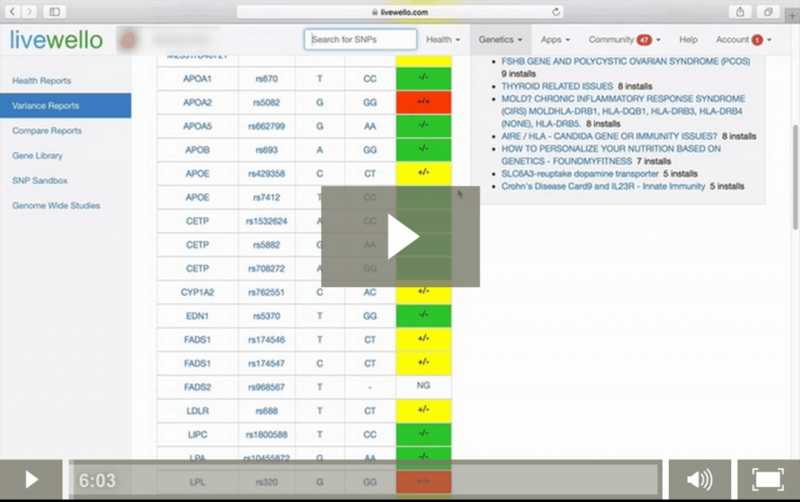 The test in the video was done through 23andme and the results have been uploaded to Livewello.com to get the health information, the cardiovascular information is not found in their basic reports and this is a special template that I have made. Other genetic health templates that are available are obesity and diabetes, methylation, brain health, how well you absorb certain nutrients like B vitamins, Vitamin D, selenium and zinc, and if you have the genes for gluten intolerance or dairy intolerance. If you would like more information on the genetic testing you can schedule a consultation here.